Wireless Bugs Detector : Spy cameras, listening devices, GPS trackers. It has a many ways t..
Professional DetectorEnjoy the Simplicity of a genuine bug spy detector. it is a gel so a GPS listen..
RAKSA iDet Selective RF Detectoris efficient in detecting ans finding the exact coordinates of surveillance systems. It is an anti or counter surveillance device. it will give us a variety of ways to track if anyone is listening or following you illegally.It also detects many kinds of signals and Wireless modules like GSM900/1800, UMTS(3G), 4G LTE, CDMA450.It is a top-of-the-line listening as well as camera spying counters for surveillance device. it also detects Bluetooth as well as Wi-Fi types of surveillance devices. It does AM FM and PM radio transmitters with analog modulation as well as digital modulation and continuous carriers FSK psk. As far as detection of bugging software goes, it also finds wireless video cameras. The Raska Uses its surveilling techniques to sweep the receiver up to 10Mhz bandwidth. This is a very good range. It can scan and cycle through modes within a time period of one second to one and a half seconds. That is amazing it can do different search modes and operate on a guard mode and monitors all kinds of digital signals. 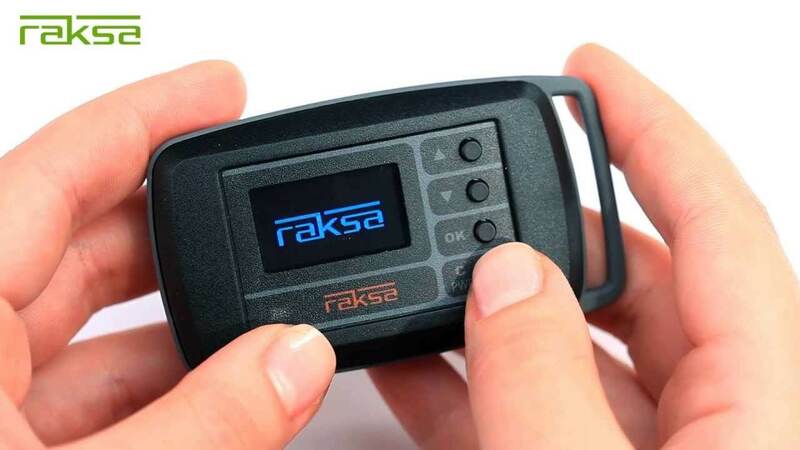 The Raksa has a very small and compact size with a 128 - 64 OLED display. that provides very high levels of working with this very significant device. It gets alerts from the alarm event slog When it is in guard mode. It captures all the information about the signals coming in when you're in the guard mode. It will give you all information that you need on the suspect.You can feel secure in your home, workplace, the ladies room or men's room and know that you're Raksa device is working hard to keep you protected. Radio transmitters with wideband modulation up to 10 MHz bandwidth. RAKSA iDet Selective RF Detector is a superheterodyne receiver with low IF and frequency synthesizer which can scan and analyze within a cycle period of 1.0-1.5 seconds. RAKSA iDet can operate on guard, sweep, search, difference search modes and monitoring of digital signals. Guard Mode provides continuous monitoring of analog and digital radio signals in automatic mode and setting off an alarm in case of threat radio signal (signal exceeding the preset threshold level) detection. Guard Mode is also used in cases when the primary signal source has not been activated. The information about the alarm events are recorded in the Alarm Log. Guard Mode enables the background noise deduction for analog signals thus reducing the influence of regular background noise. Slow fluctuations of its level are ignored thanks to the adaptation algorithm. Difference Search Mode is used for detection and localization of analog transmitters. This mode has its advantage in case the transmitter is located in the same room. In this Mode the device defines the relative level of the signal its difference with the reference spectrum that was fixed at the beginning of operation in this Mode. The closer to the source of radio signal located in the room the higher is its signal level in comparison with the outside radio transmitter. The RF Detector selectively reacts to the change of level thus enabling to locate the radio transmitter at a higher rate. Differential Search Mode utilizes both light and sound indication of the relative signal level. Monitoring of Digital Signals is intended for detection of mobile phone signals (GSM900/1800, UMTS(3G), CDMA450 types), cordless telephones (DECT standard), Bluetooth, Wi-Fi and other impulse signals in 2.4 GHz. In Monitoring of Digital Signals the display shows the list of all digital signals and their strength levels. Alarm Events Log accumulates the information about the threat signals detected in the Guard Mode. The max number of records 200. If the detected threat signals are of different types the Log will record all of them. The display shows the moment of detection and the moment of the signal extinction, the type and the max level of the signal. Wireless Bugs Detector : Spy cameras, listening devices, GPS trackers. It has a many ways to select the type of mode that you want. You can have a sound mode, vibration mode, acoustic mode, g..
Professional DetectorEnjoy the Simplicity of a genuine bug spy detector. it is a gel so a GPS listening device. It is a bigger e new on the market which can tell if both mobile phones and home phone a..